Taillights can be very elegant and beautiful. Some are shaped like raindrops, others emerge from the fender like a submarine parting the waves. 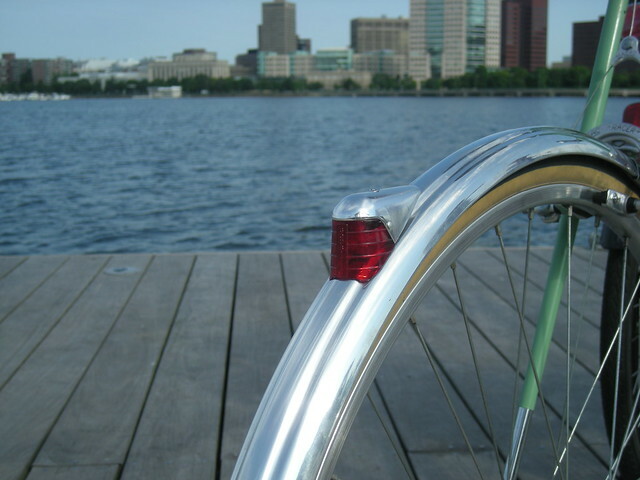 There are minimalist taillights like the beautiful JOS lights that René Herse mounted on the seat tubes of his randonneur bikes. In recent years, the LED revolution not only has made headlights much brighter, but taillights have improved as well. More than added brightness, generator-powered LED taillights offer the advantage of a standlight, so you are visible when stopped at a stop sign or traffic light. However, even the nicest modern taillights, like the B&M Seculite (below), lack the elegance of the old lights. 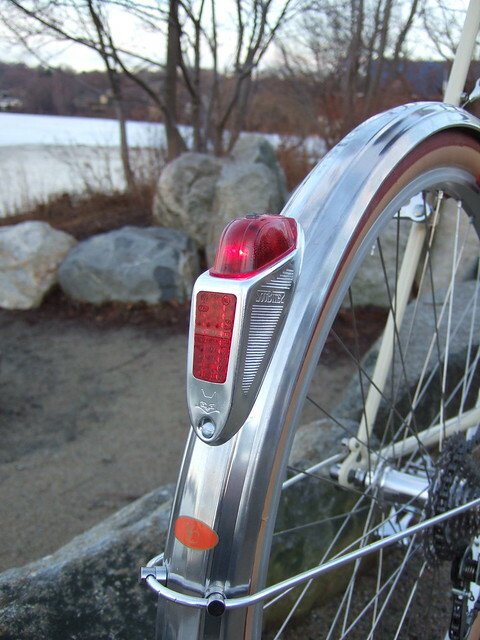 Some American constructeurs are making their own taillights with modern LED internals. Others have converted classic taillights to modern LED circuits. Either approach requires considerable effort and expense. 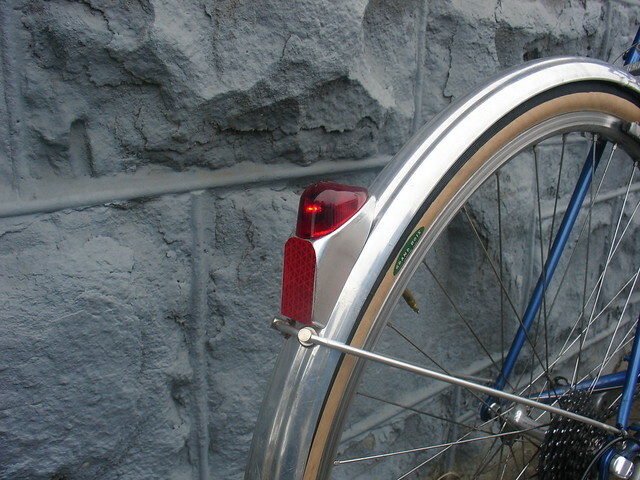 We now offer a red LED insert (above) that screws into a classic taillight. It even includes a standlight circuit. It’s a clever design: The housing of the LED is shaped like an old incandescent light bulb. You can power your lights with a generator hub or even a classic sidewall dynamo. You can simply replace the light bulb of your taillight with this LED bulb, without any other modification. If you ever want to return your light to original spec, you can put back the incandescent bulb. We’ve tested the LED bulbs. They are bright. The standlight remains lit for at least a minute at full brightness. They work well with the higher voltage of modern LED headlights. Unlike incandescent bulbs, they don’t burn out, but last a very long time. The Busch & Müller Lyt is an affordable LED light that offers remarkable performance. It was the clear winner of the “affordable light test” in Bicycle Quarterly. We were surprised how good this light is: Its beam is bright and broad, yet the Lyt does not blind oncoming traffic. You could ride all night with this light. It even has a standlight and an On/Off switch. For just $49, there is no reason to continue using your dim old halogen headlights. And of course, we also sell the Seculite taillights, as well as Schmidt’s excellent generator hubs. Brighten up your holidays and winter riding with a generator-powered lighting system! This entry was posted in Lighting, Product News. Bookmark the permalink. I have an IQ Cyo N (standlight, 60 lux version) on my road bike and like it a lot. I run it with a Shimano LX dyno hub, which has a disc brake option. I’m considering putting it on my mountain bike for night riding fun. I would then buy another rim brake specific one, when I could afford it, to replace the LX. I believe the LX version dynamo hub has the 3N 80 internals, so another Shimano hub would give me the same efficiency and lighting. 1) Would the B&M Lyt be a good choice for mountain bike trail riding? 2) Would a SON make my Cyo N significantly brighter than the Shimano? Like everyone else I totally covet the SON! The Lyt does not have a beam pattern that is as well-defined as the IQ Cyo. It all depends how much light you need… I consider the Lyt great for in-town use and occasional night rides. My son has it on his bike… For randonneuring, I use the Edelux or the IQ Cyo, since it has the best performance. 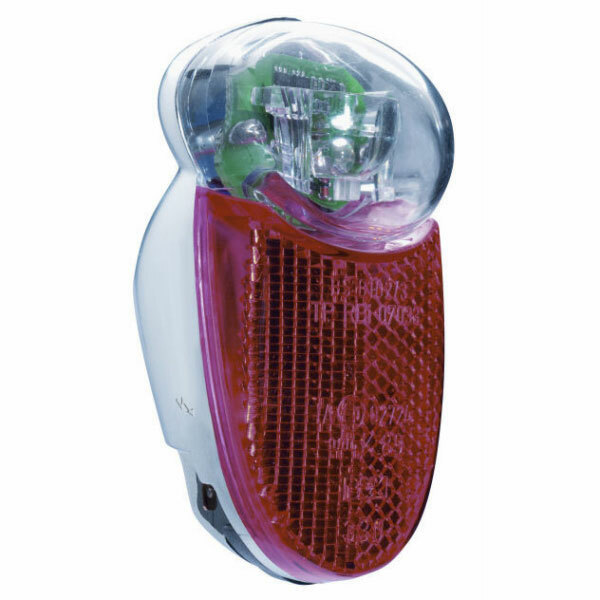 Another option to consider is the new Philips Saferide headlight. I haven’t had time to put it on my bike yet, but everyone who has tested them says that they are even better than the Cyos. Their only downside is that they’re pretty ugly and heavier than the Cyo and Edelux. Anyway, I’m glad that Compass is now also selling BUMM lights. Busch & Müller actually introduced the Cyo R to address this concern, but when we tested it, we didn’t like it as much as the original. It will be interesting to see how the Philips stacks up, but as you say, the aesthetics make it hard to integrate it into a beautiful bike. In my experience no matter what light you have mounted to the bike, it is highly likely that you’ll want a helmet-mounted light, too. The bike-mounted lights are too often not pointing where you’re looking, both in the case of curves, side trails, and looking over obstacles (the lower a light is mounted on the bike, the more the far side of that log is hidden in shadow). If I had known about the screw-in LED, it would have been much easier! Fortunately, I did not have to hack the original Soubitez housings for my retrofits, and they can be reverted to their original configurations at any time. However, retrofitting with hacked LED circuits can still have an advantage: the Seculite uses a very large capacitor that can maintain LED illumination for about four minutes, which is more beneficial for commuters in dense urban environments, where waiting several minutes at stoplights is common. The screw-in LED idea is brilliant! I looked far and wide for a more elegant taillight solution and also ended up retrofitting an old JOS taillight with the internals from a seculite plus but it was a lot of work. Wonderful to have all this new stuff. Here in Europe, tail lights have to meet EU regulations, and antique lights with updated innards would still be illegal. Taste is a personal thing, of course, but I think the Seculight is actually a rather elegant modern design. I welcome the new aluminium and chrome plated versions. They will look perfect with Honjo and Berthoud fenders respectively. I also have a question about headlights. We have a few Edeluxes on our bikes, and even though I like them enormously, they have two weaknesses in my experience. The first is that the beam pattern is a bit too focussed for trail use. I think another model that sacrifices some centre illumination in favour of a wider and more diffuse beam would be nice some some people. The second weakness is that visibility from the side is minimal, and even from the front the very small size makes it less than visible to others. So for a commuter bike the old E6 with the large reflector and the lit edges may still be better. How does the new Lyt fare in this respect. Am I right that it is bigger, and has better side illumination? By the way, B&M now also do a more retro looking version of the Lyt called Lumotec Classic (unfortunately not very visible from the side). The “retro” versions of the B&M lights – which we do sell – to me don’t look right, and I actually prefer the “honesty” of the basic plastic versions over the “fake metal” ones. Being seen from the side is probably somewhat important while riding next to cars, either merged into multilane traffic, or in the bike lane. As much as I avoid these situations, they’re a reality in most cities (where the lyt really shines). You make a good point, but I don’t think the headlight will help you there. Riding next to cars, you’d need a light pretty high up. A little 1″-wide window that is illuminated, placed at fork crown level, won’t make you visible to a car driving next to you. Even cars aren’t illuminated so they can see each other. It appears that you mostly notice a car driving next to you because you see their headlight beam illuminating the road ahead. I’d convert to wingnuts if I could get ones that look like the middle illustration up top ^^^. Those things are delicious! So you first loosen it, which requires some force – hence the two sides. But then you need to unscrew it completely, and for that, the hole allows you to put your finger inside and spin like a crank. (The Nivex wingscrew actually had a little knob to act as a crank.) True wingnuts don’t get removed when you take out the wheel, but just loosened a few turns, so no cranking is required. The LED bulb is a great idea. Of course, the next product you will be introducing is a beautiful LED taillight with housing designed to match the Edelux, right? I vote for a fender-mounted model that resembles a submarine. These conversion LEDs have probably just made the pile of old tail lights that we have sitting in a corner of the shop useful again. This is good! The LED replacement light is pure genius. So good it makes me want to get a classic taillight and run a wire for a rear dyno light, which is something I’ve studiously avoided. 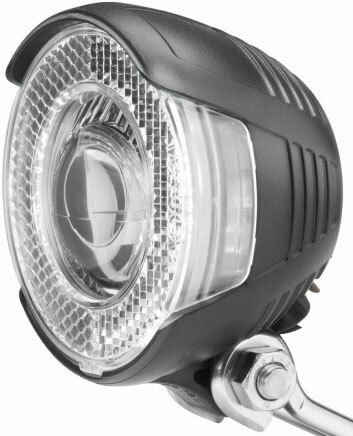 The Lyt headlight is excellent value (as is the Seculite rear – I run both on my commuter bike since last winter). Its beam really makes riding on the streets at night far more agreable than the old halogen lights, and the sensor switch is a real plus, you just never have to worry about your lights. The only thing I dont really like is actually the dark spot you mention, but it’s more of an esthetical problem than something that impairs vision. I am glad you like the Lyt as much as we do. To clarify, we sell the Lyt without the sensor. The appeal of the Lyt is the inexpensive price, and the Sensor adds significantly to the cost. If you want a light with all bells and whistles, you probably should get the IQ Cyo or the Edelux. Can you source a white, headlight version of the drop-in LED? My LBS, Clever Cycles (Portland, OR) has a pile of old halogen-bulb headlights. They are literally selling them for $2.00 a piece, to get rid of them. A $20 LED drop-in replacement would be wonderful. I know the beam would not be properly focused, but they would be fine for riding around it town, and a least as bright as the halogen-bulb versions. Taillights use LEDs without sophisticated optics – the LEDs by themselves are bright enough. 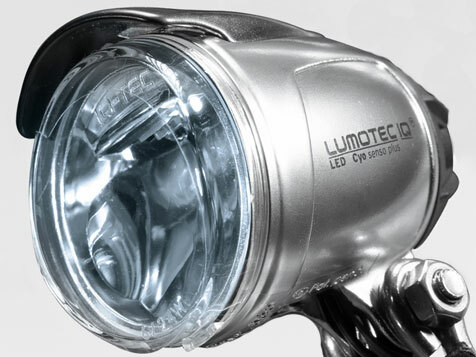 For a good headlight, you need some pretty sophisticated optics, and simply dropping an LED into an old headlight isn’t going to be satisfactory. LEDs also emit light differently – less of a point source than a halogen bulb – so you need a different reflector. Using the old lights with their original halogen bulbs (which we also sell) probably would work better, but I’d just recommend the B&M Lyt instead. Just as an aside, I learned that the Soubitez Catalux taillight lens has some primitive yet effective optics built in, focusing the light to the rear. After retrofitting with a B&M Seculite and centering the LED behind the lens, I found it to be tremendously bright to traffic behind the bike, with less illumination to the side. But I generally agree, a bright taillight doesn’t need any sophisticated optics. 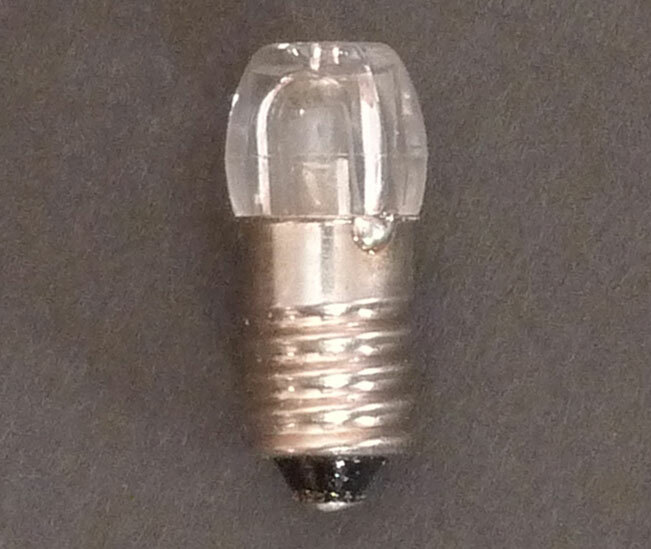 white headlight versions of the LED drop-in ‘bulb’ are also made and available. although i have the red LED ‘bulbs’ in the rear of my city bikes here in Germany (brilliantly bright, they are! ), i haven’t used the white front LEDs as they are destroyed by Shimano hub dynamos. Jan’s right, below: a retrofit wouldn’t be perfect, but you’re quite right as well, Joseph: they would be better than the halogens for city riding if the price of the parts is well shy than the LYT, and you don’t run a Shimano hub. And i’m quite sure the bulbs also have a standlight. Halogens aren’t that awful for city riding, it’s just that the new lights are so much better. Instead of spending any more to marginally improve an obsolete system, I’d save for a little and get a LYT. The taillight LED bulbs are different, as they offer all the functionality of a modern light, but can be adapted to a classic housing with more attractive aesthetics. Slightly OT but speaking of taillights: in PBP I experienced a lot of blinding from poorly set up taillights. I saw that a lot on American bikes. So maybe a few words about taillight set-up by BQ would help to improve the situation. Randonneuring is perhaps a special situation, because you ride in close quarters with many cyclists at night. More commonly, taillights are only seen by cars approaching from behind and then passing you, so their “exposure” is brief, and they (hopefully) don’t get too close as they give you a wide berth. You are right, though, that with lighting, too many people simply think that being seen is all. Brighter and flashing lights may be more noticeable, but there is no need to make a nuisance of yourself. Cars use low beams when there is oncoming traffic, even though high beams (or even flashing lights) would be more visible. Similarly, a well-designed and well-oriented set of front and rear lights will make you visible. And blinding traffic approaching from ahead or behind never is a good idea for safety. This whole topic really deserves another post or even an article in Bicycle Quarterly. May be a dumb question, but that screw-in light emits red light? Given that most tail lights have red lenses, why would you need a bulb that emits red? Unlike incandescent bulbs, which always emit white light (and need colored glass which reduces the light intensity), LEDs emit all kinds of colors without significant loss of brightness. Once you install the LED in your taillight, you won’t notice the difference. I hadn’t thought about that, but you may be right. For a long time, LEDs were available only in a narrow range of colors, usually red, green and yellow. I remember the first blue LEDs in the 1980s, and white LEDs are much more recent.